Last night I attended a lovely event in Oak Cliff with two members of the board of Loving Garland Green, Anita and Robert Opel. Mayor Doug Athas who also attended had invited us to this event to spend a delightful and informative evening with architect Ross Chapin at the Bishop Arts Theater Center in Oak Cliff. Pocket neighborhoods are small clusters of houses, gathered around a shared area, that foster community and yet preserve privacy. 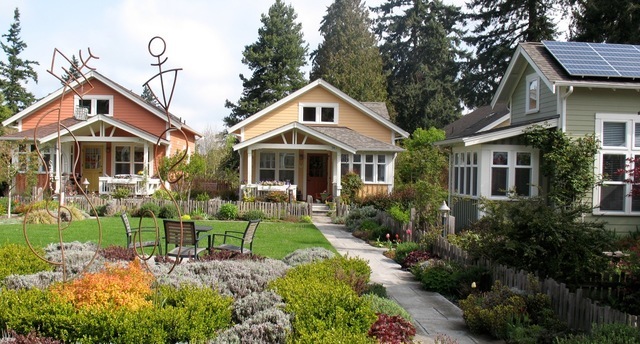 Pocket neighborhoods are proven successes and these areas are absolutely beautiful. You can purchase Mr. Chapin’s book, Pocket Neighborhoods: Creating Small-Scale Community in a Large-Scale World on Amazon. Chapin is an internationally acclaimed architect, land planner and author from Whidbey Island, Washington. He has designed dozens of neighborhoods across the U.S. and Canada and has been a development partner on six pocket neighborhoods, several of which have received national housing awards. His first pocket neighborhood design was developed on four lots (2/3 acre). It has 8 cottages located on it. Density issues are solved by design. These pocket neighborhoods provide an amazing amount of privacy. No one has their neighbors looking into their bedrooms for example. All houses are designed to have a view of the commons. Thus you can see when someone comes into your neighborhood as the commons are visible to all the homes. In addition, all the houses have front porches. These are semi-private areas of the homes that look out onto the commons and at the same time are layered with landscaping from the walkway around the commons to provide a sense of separation. In addition, many of us have read about Mr. Chapin’s work and were excited for the opportunity to meet and chat with him regarding his highly successful experience at creating pocket neighborhoods. Pocket Neighborhoods have a long history. While the concepts of pocket neighborhoods and micro-villages may seem like revolutionary new ideas of the 21st century, they are not. In modern times this concept dates back to the late 1800’s when Ebenezer Howard published his book: To-Morrow: A Peaceful Path to Real Reform and then built two garden cities in England. Limited size – the homes are usually no larger than 1,000 square feet. Parking is located on the perimeter of the neighborhood. In order to get to one’s home they must walk a few feet though a commons area. It’s amazing how much privacy and yet access to one’s neighbors that the design of these homes provides. You can see from the photos in Chapin’s book that they are carefully positioned and designed to create the illusion of a much larger space. One definitely does not get the feeling that the neighbors are on top of one another. The feeling from these neighborhoods is more that of living in the middle of a large beautiful garden with best neighbors nearby. Most of our homes now are designed to isolate us from our neighbors and even insulate us from them. We drive into our garages, and walk into our homes. Most of our backyards have six to eight foot high fences. We can go weeks, even months without even seeing our neighbors. However, all that is changing. Pocket Neighborhoods are popping up all over – from Washington State to Carmel Indiana to Ardmore Oklahoma. Increasing the neighborliness of your home and community: In the final analysis change begins with you. Plant a vegetable garden in your front yard. Don’t replace your aging fence in the backyard. Instead, use that money to enhance the existing landscaping. Get active with the officials in your community and start work on establishing a pocket neighborhood code/cottage housing zoning ordinance for your city if it doesn’t already have one. The building codes for most cities today need serious revisions to make way for neighborhood designs that serve the needs of more citizens. Living in a pocket neighborhood is not for everyone. However, it is becoming increasingly more attractive to a large segment of our aging population as well as to 80 million Echo Boomers who are the children of the Baby Boomers. Journey North reported that Monarch butterflies left their roosts in Michoacán, Mexico, on March 24 in what is one of their latest departure on record. It's a good thing though, as the Milkweeds, at least in North Texas, are for the most part barely substantial to support the caterpillars in this important first stage of their journey. 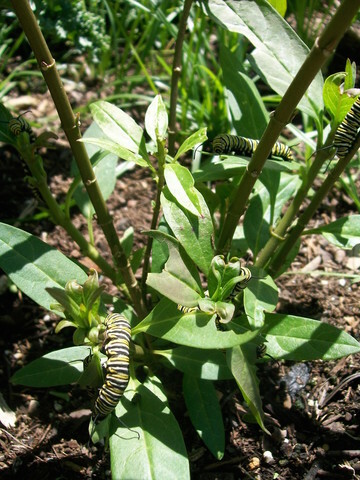 The milkweed is the only plant on which the Monarch butterfly will lay its eggs. 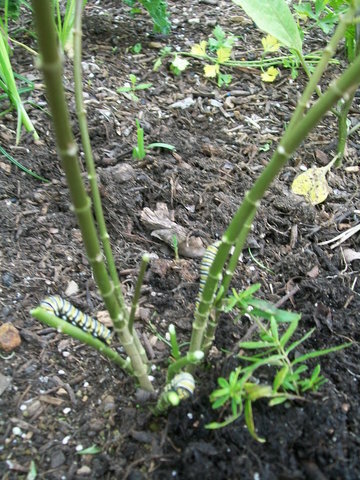 At the Garland Community Garden we have two puny Tropical Milkweeds which I noticed yesterday are now host to no less than seven Monarch Caterpillars. I know there is a certain school of thought who say the tropical milkweeds are not good and the people should not grow them, but I can tell you for a fact that if the Monarchs had to depend on the tiny two inch native Texas Green milkweeds in our community garden today, they would be sorely out of luck. It takes about six weeks for Monarch to develop from an egg into a butterfly. 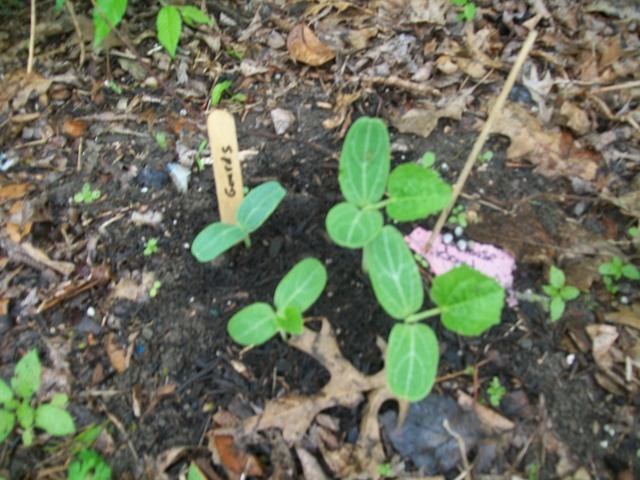 The ones shown in the photo above from the Garland Community Garden have about another month to go. They should be butterflies about the second or third week in May. However, survival rates are low. Only about 5% survive to become fifth instars. The others are killed by a variety of predators, including ants, spiders, true bugs, beetles, and lacewing larvae. 1. Life for the monarch begins as an egg, laid underneath a milkweed leaf. Three to five days later . . .
2. That egg hatches into a first instar larva (caterpillar). Over 9 to 15 days . . .
At about two weeks or 15 days. . .
3. Caterpillar pupates. They form a shell called a chrysalis or pupa. Nine to fourteen days later. . .
4. Adult butterfly emerges from the pupa casing, pumps fluid from its abdomen into its wings and flies off to nectar, mate and if a female to lay eggs. Adult butterflies that don't migrate live another 2 to 6 weeks. More detail on Monarchs can be found HERE. Yesterday (Sunday April 26) I returned to look at the Monarch catepillars. 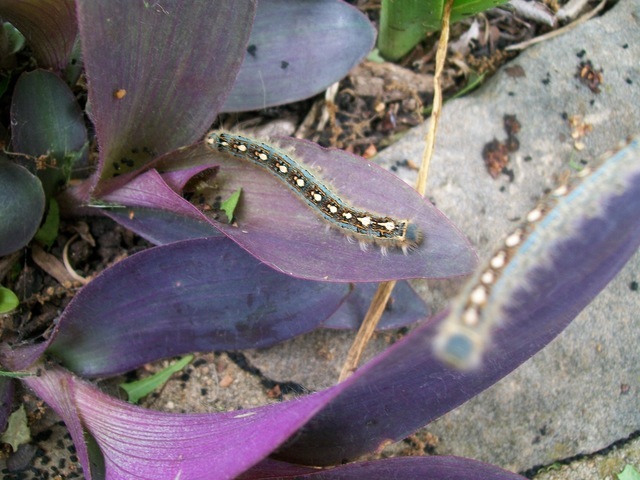 They have eaten all the leaves from both milkweed plants which were only about 15 inches high. When I saw them they were munching on the stems. I don't think the caterpillars are large enough to form pupas so my guess is they will die. I'll report on Tuesday with an update. I've called all my friends and no one has plants any taller than few inch seedlings. I wonder if, due to our cold wet spring and the late arrival of the milkweed if we will experience a loss in the Monarch population as we did a couple of years ago. The photo below was taken at dusk of the same day the photo at the beginning of this article was taken. All the leaves are gone. In the bottom left you can see a caterpillar munching on a stem. Notice all the green leaves in the bottom of the photo above. These are milkweed leaves. By the time I saw them in the morning they had already defoliated the top part of the plant. By evening of that same day they had defoliated the entire plant--in the space of about six hours. Who needs the ocean when you have DDT? Only years after the damage is done do we learn the truth about some chemical products sold for general use by the public. Our government and chemical corporations told us that DDT was safe for humans. 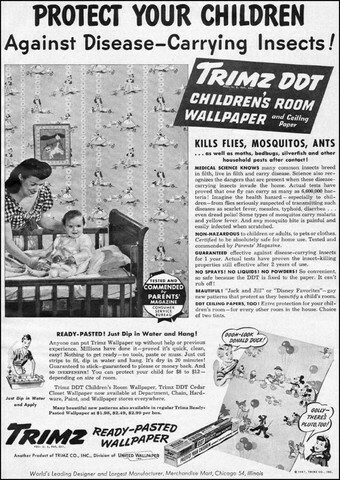 Prior to 1972 when its use was banned, DDT was a commonly used pesticide. 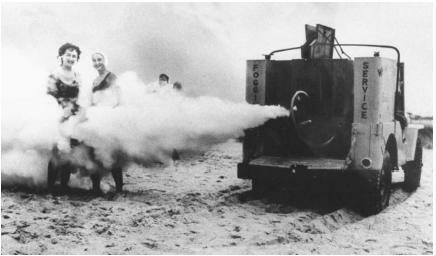 In fact, children played in the “safe” DDT fog. Other parts of the world continue to use DDT in agricultural practices and in disease-control programs. Therefore, atmospheric deposition is the current source of new DDT contamination in our Great Lakes. Note: Agent Orange isn’t around any more but one of its key components (2, 4-D) is still produced by Dow and sold in over 70 products including Scott’s Weed and Feed, Miracle-Grow Weed and Feed, Weed B Gone and others. Agent Orange was a color-coded herbicide that consisted of a 50/50 mixture of two individual herbicides: 2,4-D and 2,4,5-T. The herbicide 2,4, 5-T, which contained Dioxin, a by-product of the deliberately accelerated production of 2,4, 5-T, is a carcinogen that remains toxic to the environment for decades. Its sale has been banned in the USA. I suggest reading the NPIC 2,4-DTechnical Fact Sheet http://npic.orst.edu/factsheets/2,4-DTech.pdf before using any of these popular herbicide products containing this chemical and then you can make an informed decision for yourself. Don’t rely on marketing information from those who profit from the sale of these products—that is nothing short of stupid. Glyphosate is the active ingredient in Roundup. Regulatory and scholarly reviews of the toxicity of glyphosate found it to be relatively safe as an herbicide just as they did for DDT for years. A meta-analysis published in 2014 identified an increased risk of NHL in workers exposed to glyphosate formulations. In March 2015 the World Health Organization’s International Agency for Research on Cancer published a summary of its forthcoming monograph on glyphosate, and classified it as "probably carcinogenic in humans" (category 2A) based on epidemiological studies, animal studies, and in vitro studies. I can remember my mother and grandmother using this stuff in their gardens—especially on the tomatoes. Sevin is highly toxic to bees, mollusks and aquatic invertebrates. Resulting runoff from groundwater affects the entire food chain. Furthermore, Sevin combines with 2, 4-D found in Scotts Weed and Feed and miracle Grow to increase the toxicity of 2, 4-D. Continuous inhalation of Sevin dust can cause pneumoconiosis, more commonly referred to as “Black Lung Disease. Note: the problem with many of these tests that our government performs is that they are conducted in the laboratory and often do not take into consideration the interaction of a chemical with other chemicals that are often present in the natural environment where these pesticides are applied. More often than not only one or two variables are tested in a lab setting. We can look for healthier organic control for the pests and plant diseases in our gardens. At least, as the current President of Loving Garland Green, that is what I advocate our members. As stewards for the Garland Community Garden we are bound by our agreement with our city to not use pesticides and herbicides in the garden. We can experiment with organic solutions. Instead of Sevin Dust, some say to use Self-Rising Flour that has yeast in it. Insects supposedly taste of this and then swell up and die. I’m not so sure about this. I would have to see it to believe it. Furthermore, I have enough common sense knowledge about flour to know that if it is applied shortly after a rain that it will form a paste on the leaves of a plant. This in turn could create a great environment for mold. I would need more first-hand experience before jumping on this bandwagon. Until I have further information/education on this topic, I’m not subjecting our tomatoes at the garden or those in my garden at home to this test. If someone else wants to—be my guest. This one just doesn’t pass my common sense test. I’m going with Sluggo for now. DE or Diatomaceous Earth – absolutely! I would recommend DE to kill any fire ant mound on the planet. I’ve done it more than once. They are dead within a few hours. For the gentler kinder gardeners who want to make fire ants their neighbors problem, you might try molasses granules, which you can probably get locally here in Garland at either Rhodes or Roaches. Molasses granules are said to make fire ants pack up and leave—again I can’t personally vouch for this, but there are many claims to this effect. Vinegar instead of Roundup for herbicide. I cannot recommend this, as I have not tried it—yet. However, I do plan an experiment down at the garden using vinegar as herbicide. Specifically I plan to spray two clumps of grass with vinegar and water (20% vinegar and 80% water) and see what happens. I’ll take photographs and publish them in an article here in a few days. Then, if the vinegar kills the grass, I’ll dig up one clump and plant a transplant where the clump of grass once was to see if the residual from the vinegar affects the growth of the new plant. 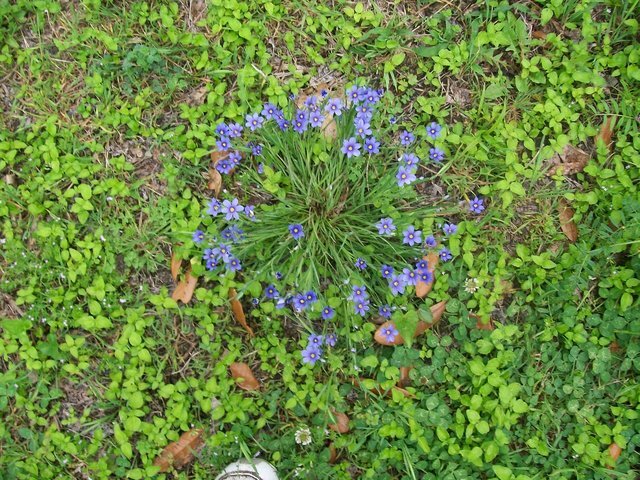 As for the other clump of grass, I’ll let it stay, wilted and dead to see how long/if grass or weeds grow in this spot. Who knows? Perhaps from this experiment we can recommend that our parks and recreation department stop using taxpayer money to purchase glyphosate laced herbicides and start buying vinegar instead which is no doubt MUCH cheaper and does far less harm in terms of pollution of our waterways. Our City and Parks and Recreation Department do not use glyphosate indiscriminately; however, they do spray it around fence posts and the like to reduce the need for labor to remove weeds in these areas. As far as I’m concerned this product meets my requirements for safety. My consciousness is not yet so evolved that I have a problem with the murder of certain insects. A little murder is OK with me—particularly when the natural balance of things is out of whack. Our almost constant rain this past month has produced an over-abundance of pill bugs, slugs and snails. In case you haven’t noticed. They will literally strip a plant of all its leaves overnight. Also I plan to set up some paper cups that I fill partially with beer (sorry Mayor Athas and Barry Swisher from our Parks Department but we will have some alcohol on park property) to see if slugs and snails are attracted to it. I’ll also take photos of this experiment as well and report back to you. Just because a product is labeled “organic”, it does not follow that precautions are not in order when considering its use. You know this, for example, if you’ve ever had vinegar in your eye. Therefore, when I perform my vinegar experiment, I’ll wear safety glasses and I will choose a day when it is not windy to spray. I would not be happy if vinegar drifted over to one of our vegetables and killed it. All the same precautions that apply for using Roundup would apply for using vinegar. Before using any type of pesticide, whether organic or synthetic chemical, one should consider all possible ramifications and take all reasonable precautions. A member recently suggested putting rock salt around the beds to prevent weed growth. He was correct in the assumption that it would be good weed control, but I nixed this suggestion immediately even though rock salt is a natural substance. The implications for such an act could be profound not only for harming plants in beds downhill from those uphill, but also for our riparian (wooded) area that is next to the creek. In addition, it would pollute the ground water that would eventually make its way to the creek. It is possible we could kill many of the wild plants and trees in our riparian area by doing such a thing. We have over 3,000 square feet of garden beds so that would be a lot of rock salt. Frankly, the more I learn regarding pesticides and herbicides, the more I think that the best control is to visit your garden daily and pick the pests off and drown them in a bucket of soapy water. As for the weeds: no better control than simply yanking them up. Thanks to raised beds, this task is easy. Down at the garden, due to our leaf layers in many of the walkways, the same is true. Weed and grass are easy to pull up. What's worse than a grandmother who shows you pictures of all her grandchildren? We want to demonstrate that it is possible to have a butterfly garden in a small space. 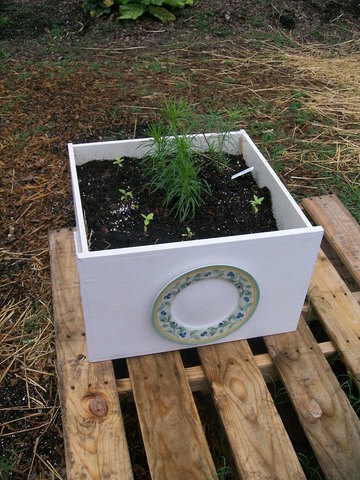 Our demonstration box features two milkweeds (host plants for the eggs and caterpillars) and several flowers for nectar. The resident bluebirds now have a place to take a bath. To the left of the birdbath is the demonstration plot for the Blackland Prairie. The home for the bluebirds is featured in the background near the riparian area. And the decorative gourds keep growing! Looks like we will be making bird houses in the fall. 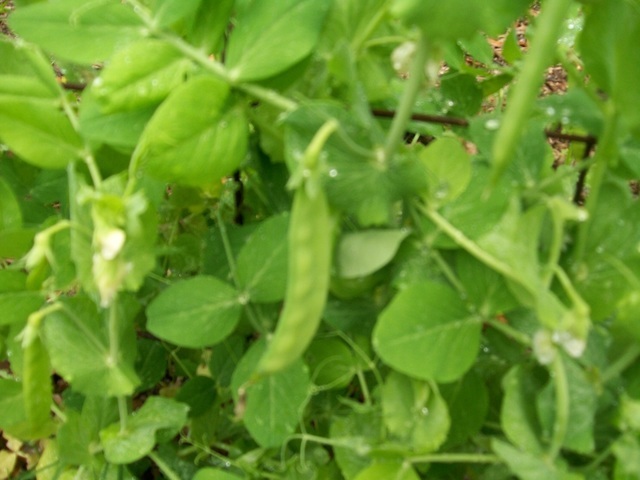 Snow peas ready to pick--I'll put on my rainboots later today and go harvest them. 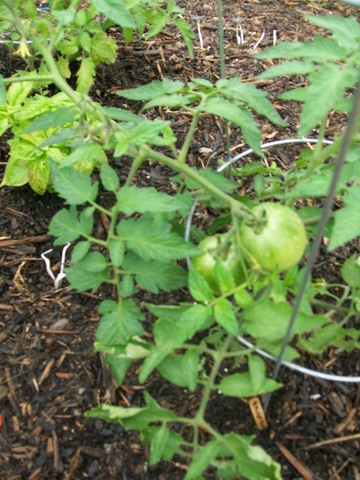 Colby's tomatoes. Look like they will still be green this weekend when he returns from his vacation. 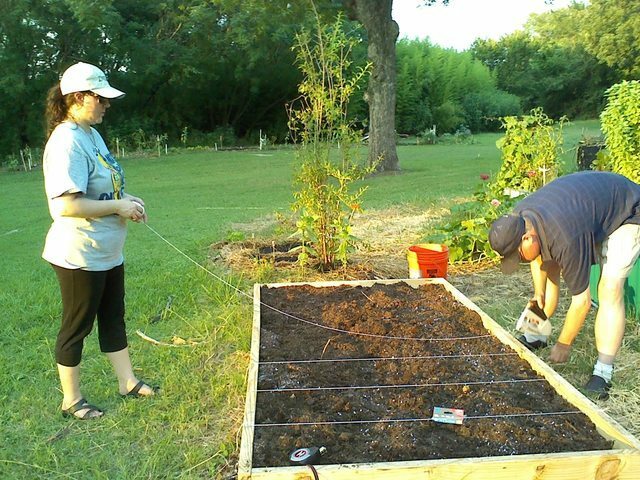 Garland Community Garden: Becky and Ed Browning installing their square foot garden. This quote from Buckminster makes a lot of sense if you will use your imagination for a moment: What would have been the outcome if Henry Ford had ranted and raved about horses and horse carriages instead of building a car? The outcome, my friends, would have been the exact sum of nothing. Furthermore, Ford might have died as a pauper as criticism rarely translates into profit for the critic. This quote also sums up the philosophy behind the establishment of Loving Garland Green and our stewardship of the Garland Community Garden. Instead of railing against multibillion dollar GMO seed and pesticide corporations, our approach is to get out there and grow our own non-GMO and pesticide free garden and invite others to the pleasure of walking through the garden and snacking from it as they go. We believe in sharing what we've done with others as well as showing them how they can do it too. We explore new ways for people to experience the benefits first hand that an increase in urban gardens brings to their lives and to their community. The more urban gardens we have in Garland, the healthier our residents will be and the healthier our local economy will be. More people will thus become aware of this relationship and act in accordance. In the final analysis, our focus is on what we can do that will actually benefit us all--not on what another is doing that is wrong. If we create a world where there is no viable market for harmful products, then they will eventually go away. The primary focus for any corporation is their bottom line and keeping their shareholders happy. If there is no market for their products, then they must either change or go out of business. No message is stronger than "by example." We hope to be the example with our urban gardens and with our stewardship of the Garland Community Garden--which, by the way, like the city of Paris France, is a pesticide-free zone. Some may not realize this, but the city of Paris France has been a pesticide-free zone since 2000. Not only are its city gardens thriving, its bee population is healthier and more productive than its country cousins--by as much as 70% more productive. Ironic, isn't it, to think that folks from the country may need to return to the city for their health. Indeed, we have turned our world upside down. Once the country was a place people escaped to avoid the pollution of the city. Today, much of the countryside in the USA is home to the unhealthy expanse of large GMO monocrops which are not healthy for insects or people--expanses which are only sustainable by increasing the use of more pesticides and herbicides and genetically engineered seeds. We are doing the same thing to our bodies that we are doing to our agricultural model. Since most of the food we eat is processed and has a low nutritional value, we are increasingly dependent on vitamins and pharmaceuticals to sustain us. It's a vicious insane cycle fueled by dividends paid to shareholders of pharmaceuticals and chemical corporations. Visit the Garland Community Garden and you’ll see all kinds of things: A resident bluebird family; a children’s garden complete with a fairy house and a magic carpet; a Native American Medicine Wheel; a Three Sister’s Garden; a wishing chair; a loofah tunnel waiting for loofah vines; a keyhole garden currently stuffed with greens; a Blackland Prairie sampler; a Buffalo Grass lawn; two small butterfly gardens; a spiral herb garden; and lots of veggie seedlings all snuggled in their beds. If you visit near dusk you’ll hear our resident owl. You may be lucky enough to see our roadrunner taking one of his fast strolls down the winding garden. Coming attractions include a watermelon patch, a black-eyed pea patch, a sweet potato vine, and several tubs of hops. Loving Garland Green members are the official stewards for the Garland Community Garden. Membership is free and open to the public. We meet every Monday from 6:30 to 7:30 PM at 216 East Kingsbridge Drive Garland 75040. We would love for you to join us. TAKE THE DART. AVOID THE HASSLE OF DRIVING AND THE $10 PARKING FEE. The Tent Caterpillars and more are here! It's confirmed! They are everywhere--even down at the Discovery Gardens. After finding no less than four in one area of the Garland Community Garden this morning, I attended the Texas Discovery Gardens plant sale and saw them all over the place in the butterfly gardens. Below is a photo I took of two of them there today. When I asked the tour guide what they were doing about them, he replied: "Nothing." The thought is that by allowing nature to take its course that the eco-system will be brought back into balance. Apparently, even though tent caterpillars can defoliate entire trees, the trees grow their leaves back and no permanent damage is done. Birds, of course, love the caterpillars. Malocosoma americanum or tent worms do not pose a serious threat according to most experts. They are sometimes confused with fall webworms but tent worms are active in the spring while webworms are active in the fall. Tent worms make their nests in the forks of branches and webworms make their nests at the tip of branches. 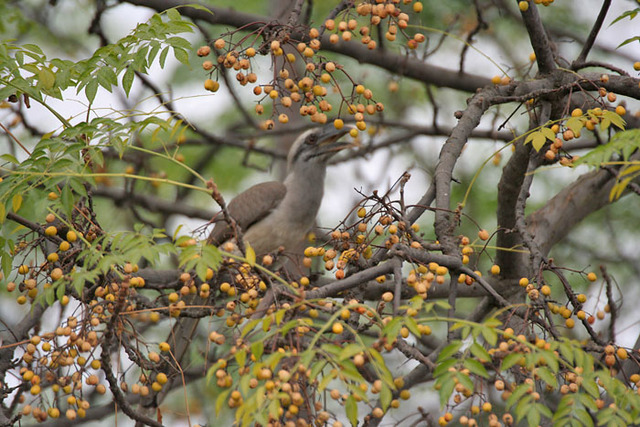 Their favorite trees are ornamental fruit trees followed by ash, willow and maple trees. They will also munch on nearby plants. Remove them in the early morning. They tend to be late risers--particularly if the morning is cool. You can get them while they are still in their nest. If you feel the need to kill them yourself, this can be done by dumping them in soapy water. Contact insecticides such as bacillus thuringiensis (BT) also work well when infestations are large. Apply BT directly to foliage and to the insect. This is an organic pesticide that does not harm other wildlife. 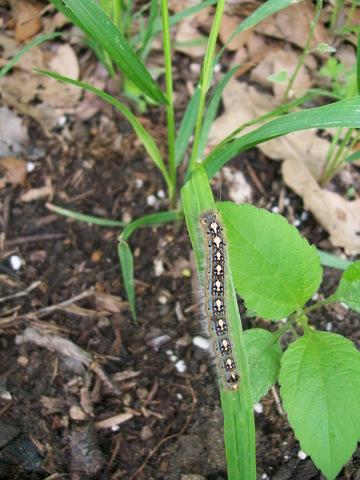 Tent Caterpillars (the larvae) turn into brown moths. 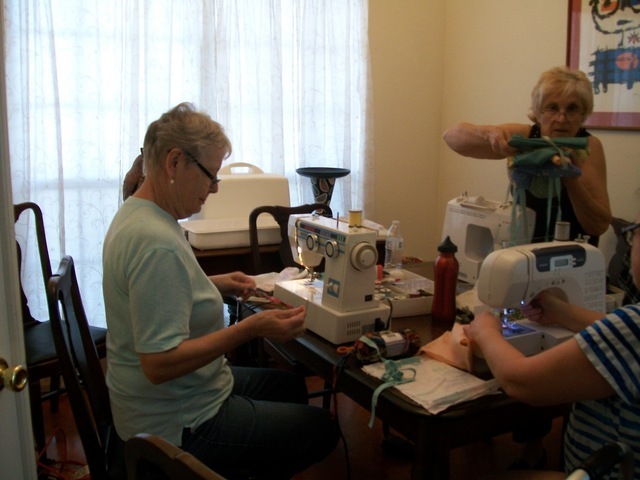 LGG Members team up to sew Paca Poo bags for the Garland Marketplace. Our truck is mostly packed for tomorrow morning--the first Saturday in 2015 for the Garland Marketplace--downtown Garland. We hope you can make it. In fact, we hope that we can make it as well. if it keeps raining. . . The wildflowers at the Garland Community Garden are making an appearance. In late fall of 2014, I threw out a bunch of wildflower seeds and now we are beginning to see the results. 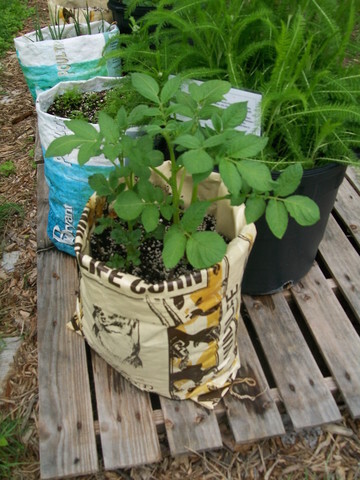 Below are two photos I took on Friday, April 17, 2015.
and the potatoes keep growing--right out of the sack! Can you judge a community by how well its leadership supports Urban Agriculture? Members of Loving Garland Green think so. 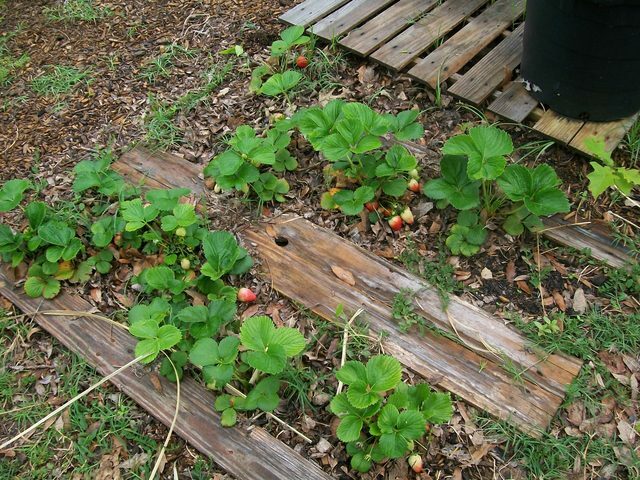 Garland Texas has many community gardens scattered throughout our city and even more citizens who are growing edibles in their yards. However we have two gardens that I believe will become the two hubs for demonstrations of what citizens can accomplish in rebuilding the physical health of their bodies and the economic health of their local economy by growing edibles. A plant based economy is a secure economy as it provides one product that will always be in demand--food. 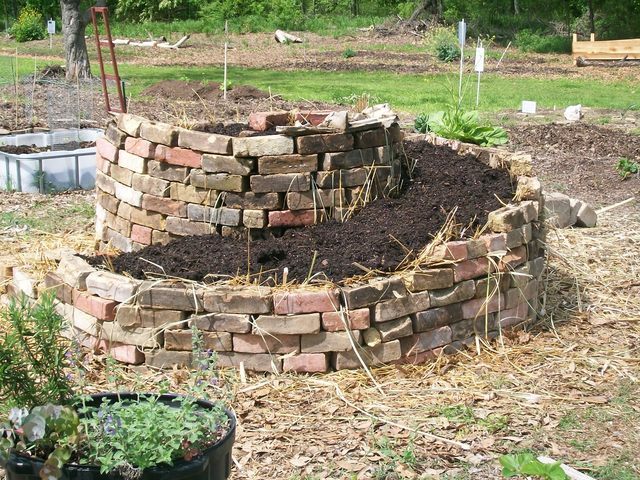 Come see the Spiral Herb Garden built Saturday April 11, 2015. We will soon be installing herbs in this garden. Spiral herb gardens were built by monks in monasteries as early as the 14th and 15th centuries. They are still today an efficient permaculture design that cannot be improved upon. The one nearest to my home and heart is, of course, our Garland Community Garden which is stewarded by Loving Garland Green in partnership with our great Parks and Recreation Department who can give lessons in budget stretching and doing more with less as evidenced by their budget and the great parks and parks programs offered by our city. This garden just celebrated our first year anniversary on April 12. In one short year the garden has grown from one garden bed of 28 square feet to a total of 3,200 square feet of garden beds. Just last night I got the OK from the Mayor's office to allow two beekeepers to install a few hives on the property. This summer, when the weather allows, we will feature various outdoor gardening classes--most for children--down at the garden. The garden has many interesting features: A Three Sisters Garden; a Loofah Tunnel; a Medicine Wheel; a small Butterfly Garden; a Spiral Herb Garden; a Children's Garden, complete with a magic carpet and a fairy house; an experimental lawn of Buffalo Grass; A Blackland Prairie Sampler; a Wishing Chair; and more. Please come and see for yourself. Last week Loving Garland Green had our first plant sale down at the garden. Selling plants at prices ranging from $1 to $3, we made $412 from 9 to 2 on Saturday April 11. Again, by doing, Loving Garland Green illustrated to our community the potential offered by moving to a stronger plant-based economy. These were all seedlings grown by our members. Entrepreneurs on the Internet report earning as much as $25,000 in annual supplemental income by growing and selling plants from their driveways. Growing edibles is not only good for your waistline and health, it's also great for your wallet. Texas A&M AgriLife Extension Agricultural Demonstration and Agricultural Research Project - Located behind the County Commissioners' Building on Rowlett Road in South Garland- Plants are awaiting a new home in the garden. I guess I'll have to stop referring to the Garland Community Garden as "nearly new." 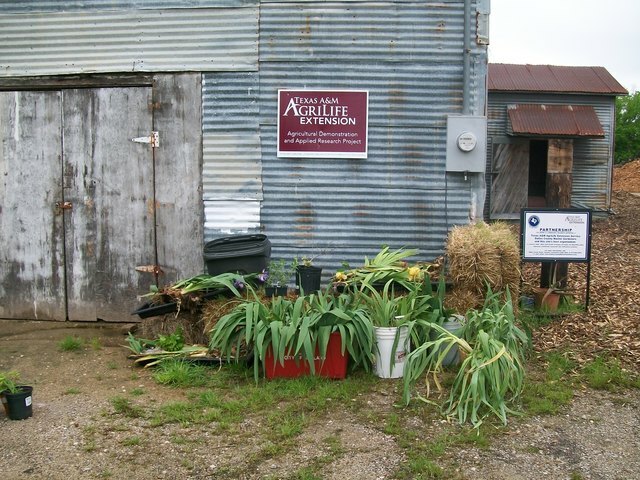 Our latest nearly new urban agricultural project in Garland is the Texas A&M AgriLife Extension Agricultural Demonstration and Agricultural Research Project which is located behind the County Commissioners' Building on Rowlett Road in South Garland. This is a great space that also has a large building that will be put to great use for gardening and hands on classes. The construction of this garden is less than two months old. Both of our Garland public gardens will require the support of community volunteers and donations in order to survive and thrive. For the past few weeks I've dedicated my Tuesdays to working with Duddly Hargrove and Linda Barnes who are the two leaders for this project. Believe me, you will get back more than you give--just from the knowledge and experience offered by Duddly and Linda. I always go away from a work session with much new knowledge that I can apply to my own personal garden as well as to our Garland Community Garden. Linda Barnes at the Garland Community Garden Anniversary Celebration April 12, 2015 - That's the thing about gardens and gardeners: we support each other in concert and not in competition. 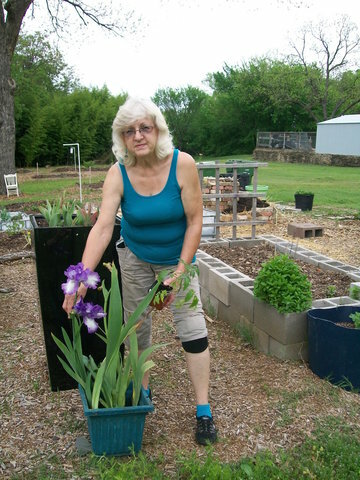 Linda took time from her busy schedule to honor us at the Garland Community Garden by bringing us plants from her garden--beautiful iris and a pear tomato plant. PLEASE SUPPORT YOUR COMMUNITY BY SUPPORTING OUR TWO GREAT PUBLIC GARDENS! Write to Elizabeth Berry at eebemma@yahoo.com for more information about urban agricultural opportunities in Garland and how you might support them. Note: Loving Garland Green is currently seeking a large unused warehouse type building (about 1000 square feet) that we can use to create a Fallen Fruit Gleaning Program similar to those already successfully established in other urban areas such as Portland and Toronto. This program would be designed to grow into a local cooperative that could eventually support perhaps up to 10 paying jobs in addition to the volunteer force. 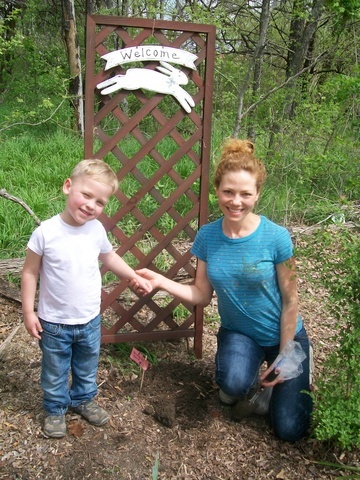 Dawn poses for a photo with her son Miles in the Garland Community Garden after they plant gourd seeds that will be used to build bird houses in the fall. Like many members of Loving Garland Green, Dawn is a busy person--a mother, yoga instructor, English as a second language teacher, and a Garland resident. Dawn lives with her husband, son Miles and a yellow Lab here in Garland. 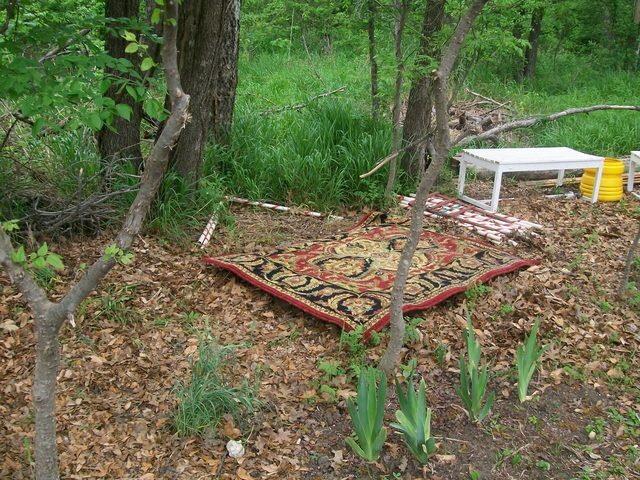 Magic Carpet at Garland Community Garden. When children (and adults too) visit the Children's area of our garden they can take a ride to any place they wish to go on the magic carpet. The carpet is fueled by the passenger's imagination. One Language Spoken Here: "Garden"
Gardens and plants are so basic and central to our lives that they remove all age, economic and cultural differences that people may have. Another great thing about gardens: You can never step into the same garden twice. Like people, they are constantly evolving. Speaking of Gardens as community. 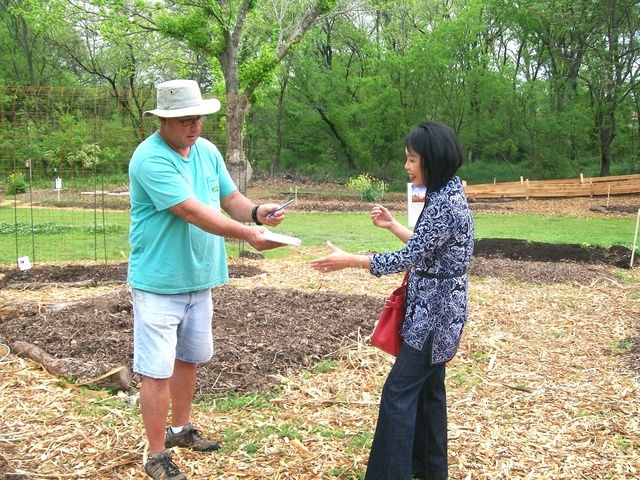 . . Below is a photo of Colby Clark and Huong Le making an important connection in the Garland Community Garden for school children here in our community. Colby, a Garland fireman and member of Loving Garland Green, is providing Huong Le with his contact information. Huong Le is a community liaison who helps make connections between volunteers and Beaver Technology Center, a magnet school here in Garland. Colby has just agreed to present a class on the topic of bluebirds in the garden. Among other things, Colby may build a bluebird house with them. Colby is an expert on bluebirds and their homes, but don't take my word for it. 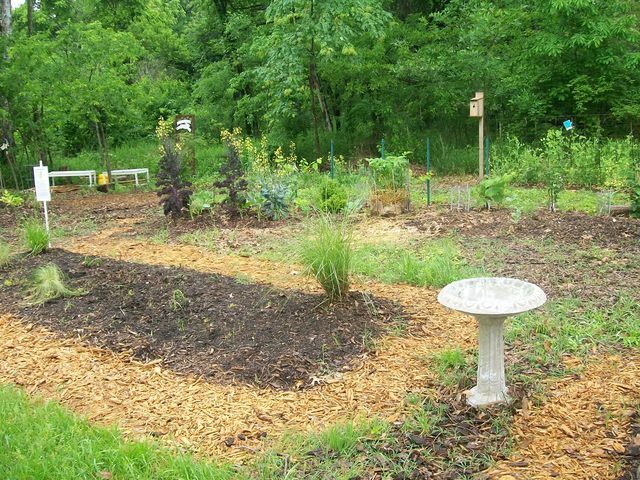 You can visit the Garland Community Garden. There you will find one bluebird home where a bluebird couple have recently made their nest. REMEMBER THE MAGIC AND PROMISE OF GARDENS BY SUPPORTING THEM IN YOUR COMMUNITY ON SATURDAY APRIL 11! ATTEND ALL OUR PLANT SALES AND START YOUR OWN URBAN GARDEN! YOU'LL NEVER BE THE SAME. 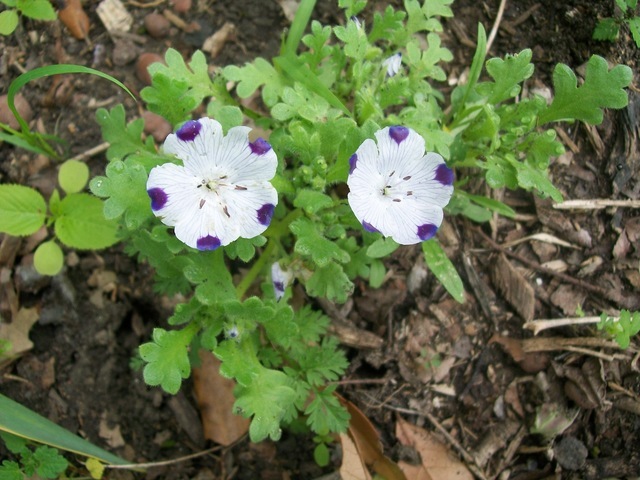 Attend all the plant sales in the DFW area and find plant that you may not be able to find in many commercial nurseries. We love and support our commercial nurseries and couldn't do without them, but once or twice a year, we have an opportunity to support our local organizations who also support our local economy and also help to provide food for those in our community who may need a hand up to get to a better place. The following is a list of Plant Sales that I know will be held on Saturday April 11. There may be others. If you know of any, please add them as a comment to this post. Thank you. Gardeners are not in competition, we are in concert when it comes to supporting our community and its people. 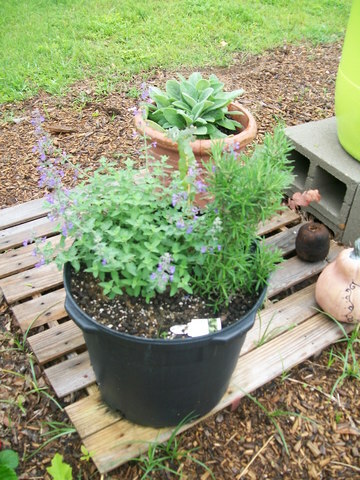 Note: Some of our members are planning to construct an herb spiral garden on Saturday. You can also visit the rest of the garden while you are there. It's fun, I promise. They will be holding their plant sale also on Saturday 9-3pm at Myers Park in McKinney. It is the one-year anniversary of the installation of our first garden bed, a 4 foot by 7 foot garden--28 square feet. Today, one year later, we have just a little over 3,000 feet of garden beds. Some of our members will be down at the garden at 3pm. There is no big hoopla planned as we will likely still be recovering from the plant sale and spiral herb garden build. We will just walk around and reflect on how we've grown and where we want to go from here. What's it like at a Loving Garland Green meeting? The content of our meetings vary but we try to have a member volunteer presentation at each meeting. The topic can be any topic of their selection, but most often these topics are related to plants and gardens. The rest of our meeting is devoted to discussing our current projects. 1. China Berry [Melia azedarach] Presentation. We had a great meeting last night. Cheryl Haynes, presented her research on Chinaberry trees which was fascinating and very informative, Although Chinaberry trees are on the Texas invasive species list, this tree may have at least one good point. As Cheryl pointed out, the berries contain neurotoxins (substances poisonous to nerve tissue). She experimented by putting some berries on a fire ant mound and reported good results. This sounds promising to me as botanical insecticides have more advantages than synthetic ones. The advantages of botanical insecticides mainly are due to their quick degradation and lack of persistence and bioaccumulation in the ecosystem which have been key problems in chemical pesticide use. Cheryl brought some china berries to the meeting and I'll be testing them this morning on an ant hill in my yard. Cheryl reported that some people say that chinaberries can also be used as soap berries--thus I'll try to wash a load with them this morning and see what happens--although I'll be sure to put the clothes through a second rinse cycle. If I walk a little crooked in the next few days, I'll chalk it up to the Chinaberry meliatoxins. Chinaberry outcompetes native vegetation due to its high relative resistance to pathogens and insects. 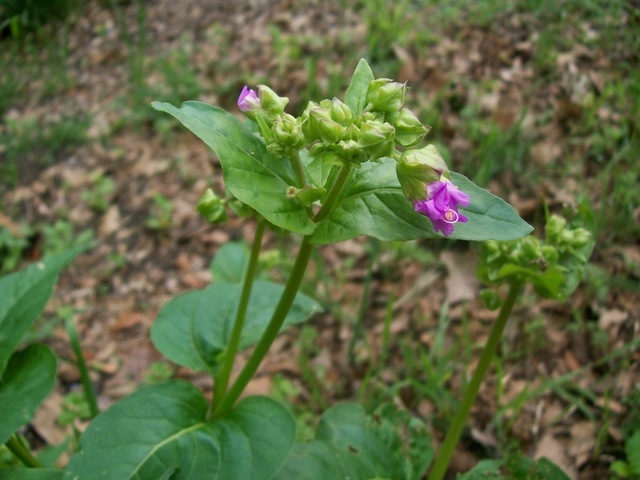 Its leaf litter raises soil pH thus altering soil conditions for native plants and seed germination. Chinaberry tree is very fast growing and reaches a hight of 18 to 24 feet in four or five years. It may reach 50 to 60 feet. It reproduces onsite from root sprouts and over longer distances via bird dispersed abundant seeds. Currently the most effective chemical controls reported are cut stump and basal bark application of triclopyr herbicides. Cut trees left untreated will grow back with several branches emanating from the stump. The entire root system must be removed. Meliatoxins A1, A2 and A3 are responsible for the toxicity of these plants. Their berries are toxic to plant and animals--including cattle, sheep, goats, pigs, dogs, rats, rabbits, guinea pigs, poultry and humans--all with documented cases of having been poisoned by china berries. Pigs and dogs are poisoned most frequently, usually by ingesting fallen fruits. They show clinical signs within 2 to 4 hours of consumption. Note from Liz: I can't believe they still sell this tree in nurseries in parts of the USA. 2. Loving Garland Green received a generous donation of $1,500 from one of our new members last night. 3. Signs were made and commitment sheets signed for the Seedling Sale April 11, 9am to 2 PM. 4. We decided to build the spiral herb garden as the plant sale is going on. Saturday April 11 - 9AM to 2PM. We watched a video showing how to construct the Herb Spiral Garden. 5. We decided to invite members and the public to the garden at 3PM on Sunday for about half an hour to celebrate and remember our journey this past year. April 12 marks the anniversary of the installation of our first bed down at the Garland Community Garden. 6. We will be meeting Friday at 6:00 at my house to load Charlie and Margie's trucks for the sale. Please support urban agriculture, Loving Garland Green and the Garland Community Garden. COME TO OUR PLANT SALE! Visit the garden and watch the build of a Spiral Herb Garden in progress. We would love to see you there. Garland Community Garden has a new rain barrel that was installed April 1, 2015. This rain barrel was created by Ken Risser. Ken, a member of Keep Garland Beautiful, has started a small business here in Garland. He hand-crafts rain barrels for local folks. These barrels are recycled pickle vats from a local pickle factory. Ken donated this barrel to Loving Garland Green. However, on Monday we will vote on purchasing a second barrel for Ken for $120. You may be able to purchase a rain barrel for $89 from a chain store BUT if you purchase your barrel from Ken's local business, more of the money you spend will be recirculated in the local economy which in turn enriches you and your neighbors. Ken's new business is a perfect example of how urban gardens create new markets and support existing markets--processes that Loving Garland Green supports. For maximum efficiency in harvesting rainwater, the design of Ken's rain barrel is best suited to be placed at the four corners of a building/home that has a gutter system. However, since we don't currently have a gutter system to take advantage of, we will be putting these rain barrels to a slightly different use. We will be using them to measure and monitor water usage over our beds. We will fill them with water from the faucet, leaving a little room in the barrel for some collection from rain. A particular rain barrel will be designated to be used for a particular bed only. Records will be kept on each barrel as to how many gallons and when the barrel is filled. Amounts can be checked with a flow meter attached to the spigot. About 60 gallons will provide about 1 in. of water over 100 sq. ft. Since our climate is especially dry and we are using raised beds, a little more water will be needed. The general rule of thumb is about 1 inch of water over your plants each week. Most people overwater. Using the 50 gallon capacity of the rain barrel and the 28 square feet of the garden bed in front of it, we should only require filling that barrel about once every three weeks. Also to maximize efficiency we will attach a drip hose to the spigot so that we water at the soil level. We would like to see every bed and/or groups of beds at the garden assigned to a particular rain barrel for monitoring water usage. This will happen over time. Even when/if we have access to a gutter system and a larger reservoir we would still like to see that system feeding into these rain barrels because visitors can more easily see just how much water it takes for a vegetable garden and it will encourage people to not overwater their plants which is never good for the health of the plants. As mentioned, Ken Risser makes these rain barrels. They are very high quality. They come with brass fittings for the spigot and the spigot itself is in a housing designed for large aquariums. The barrel has a drain valve below the spigot and also one near the top of the barrel. The drain near the top can be used to connect the barrel to other barrels to increase storage capacity and thus take fuller advantage of the rainy season. And on top of it all, Ken can design these rain barrels according to your own artistic specifications. When I went to pick up Loving Garland Green's rain barrel, I saw many beautiful barrels--all designed with various logos including one with our city's firewheel logo on it. If you are a Cowboy's fan, Ken can design a cowboy rain barrel for your home. Currently we have a few of our city organizations represented down at the garden. For example, we have a garden bed that is stewarded by the Garland Multicultural Commission. We are also putting in a large bed that combines all the city council members with the Mayor's garden. Last year we had separate beds for each council member and one for the mayor. This year, in keeping with our mission of community connectedness we are combining them. It would be nice if they could all pitch in a few dollars and purchase a rain barrel from Ken for their garden with the city logo on it. 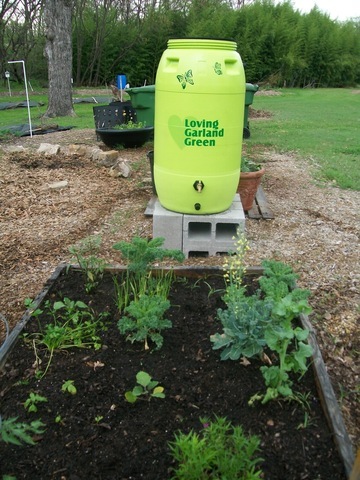 If a local or chain store business would like to purchase a rain barrel with their logo on it from Ken, Loving Garland Green will assign it to one of our beds at 4022 Naaman School Road. This makes us all winners. Loving Garland Green wins because 1) we are meeting one of our goals to improve our local economy through urban gardening and 2) we have a rain barrel that we need to illustrate water conservation methods. Ken and those who purchase rain barrels from him win because they will be broadening their customer base through advertising at a place where many of their prime customers hang out. Our community garden features two expanses of meadow: one in front of the licensed area of the garden. The official steward of this meadow is the Garland Park and Recreation Department. There is also a meadow in between the Winding Garden and the Front Garden. Loving Garland Green members are the stewards of this meadow. 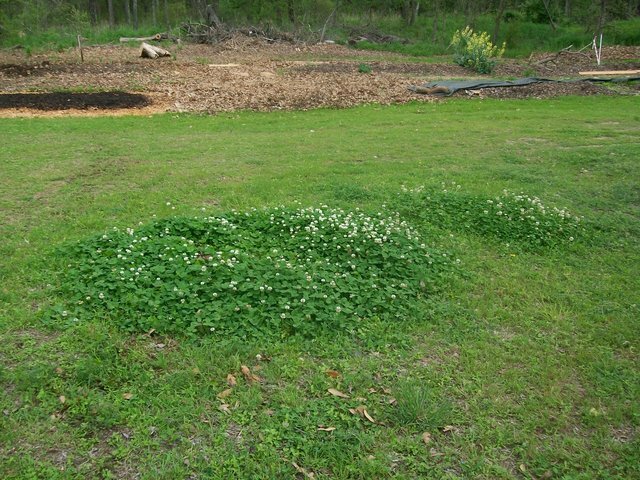 It has patches of clover that we allow to grow without manicuring as the flowers from these patches feed many hungry bees. If you ever feel like coming down and rolling in the clover, be sure to make sure it's not feeding time for the bees. It's official. We have a pair of nesting bluebirds down at the Garland Community Garden. Robert, using a telephoto lens yesterday, took a shot of the inside of the blue bird house that Colby Clark built a month or so ago and installed in the garden. There is a nest. I had my doubts about that birdhouse, but Colby assured me that he know what he was doing when he installed a tiny home, only six feet up on a post and with an opening that had no perch. He was right. In addition to their practical offerings, the bluebirds also represent the symbol for happiness in our culture. For example we have many songs with lyrics exalting this bird to the status of a good omen--The Bluebird of Happiness being one of the most outstanding examples of this connection. There will be Bluebirds over the White Cliffs of Dover is another example. Yesterday when I was eating my lunch in the garden with Margie, we had the honor to watch a chaparral (road runner) run almost the entire length of the winding garden. It is thrilling to see wildlife unexpectedly appear like this. According to reports from the Cornell Lab of Ornithology, Pueblo Indian tribes, such as the Hopi, believed that the Roadrunner provided protection against evil spirits. In Mexico, some said it brought babies, as the white stork was said to in Europe. Some Anglo frontier people believed roadrunners led lost people to trails;It is thrilling to see wildlife unexpectedly appear like this. Many times when I've been back in the garden where snow peas are growing on the trellis at the edge of our licensed area, I've heard an owl hooting. This puzzles me as I've always thought that owls are nocturnal creatures who sleep during the day. Although the owl sometimes is said to portend death, among many native American tribes this totem has other more subtle meanings bringing with it totem gifts of hidden knowledge and ancient wisdom. It is said to offer clarity in the darkness. It takes a magic person to find a magic wishing chair. And speaking of Bluebirds of Happiness, we have one member, Robert Opel, a local artist who works at the Dallas Museum of Art who is perpetually cheerful. Yesterday he came across a perfectly good wishing chair that someone had carelessly tossed to the curb. Robert, realizing the true value of this piece of otherwise ordinary-looking furniture brought it down to the Garden. Now residents can come down and sit in the wishing chair under the pecan tree and make wishes. Hugelkultur roughly translated from German to mean "mound culture." It's an ancient practice of creating raised garden bed by covering wood with soil. The buried wood acts like a sponge, capturing water and nutrients for later use by whatever you choose to plant. As it decomposes, the wood draws in beneficial fungi and quickly turns into rich soil. The results are amazing for such a simple process. 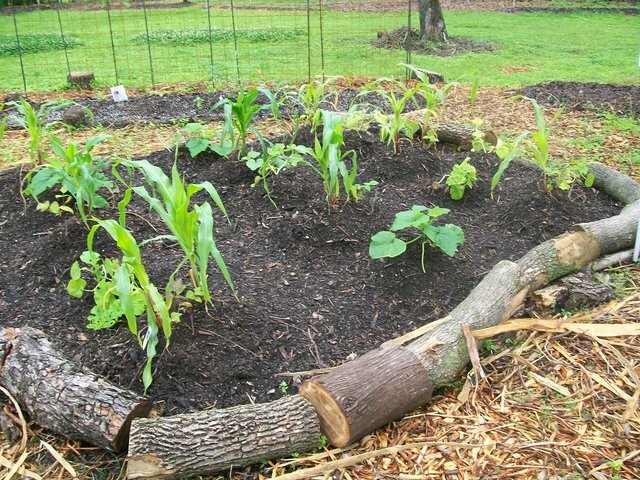 The Hugelkultur is a fertile self-hydrating raised bed. Hugelkulturs can be built up with any size and age wood. In general, the taller the pile the better. Some are up to six feet high. Taller piles will of course hold more moisture in their decomposition process. 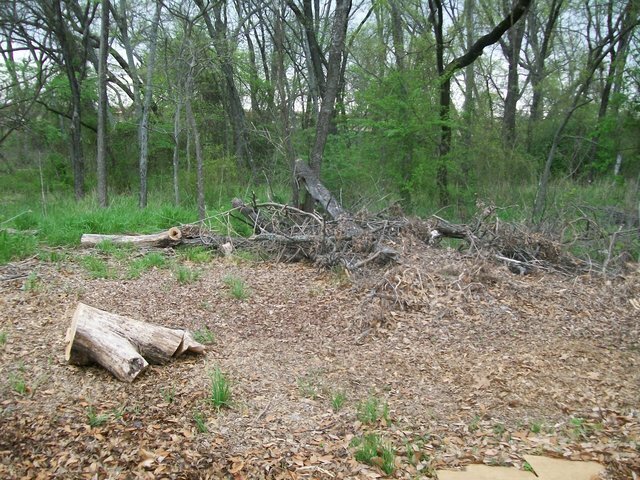 Note: Building a hugelkultur on the area indicated above would not be possible without permission from our Parks and Recreation department as they are stewards of this riparian area of the property. Such a request would and should require some investigation regarding the possibility of disturbing the habitat of creatures in the riparian area. We could, however build a hugelkultur elsewhere within our licensed area of this property. All these considerations for another day, however, as we are far too busy now in dealing with spring planting. Perhaps in late summer our thoughts will turn to hugelkulturs. 1. pick a site at least three feet wide and six feet long. 2. Put wood pile down (avoid cedar and walnut)--put the biggest pieces on the bottom. It can be as high as six feet. 3. Put soil, leaves, manure, kitchen compost in between the pieces of wood/logs. 4. Cover with at least two inches of top soil. 6. 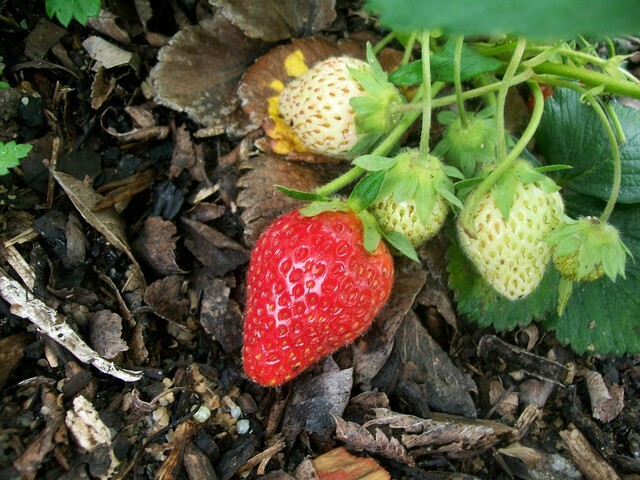 Berries love Hugelkulturs and the height of the beds make for easy picking.